When opening Outlook for Mac 2011 or Outlook for Mac 2016 from Office for Mac productivity suite, the Outlook app displays the following error message within a few minutes of opening, and then the program crashes and closes automatically. Microsoft Outlook must be closed because an error occurred. Any unsaved work may be lost. Press and hold down the Option key, and then run Outlook for Mac. The step runs the Database Utility application. 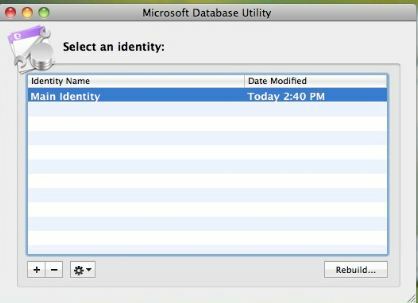 In the Database Utility, select the identity database that you’re having issue with, and then click Rebuild. When the rebuilding process is completed, click Done when prompted that “Your database was rebuilt successfully”. Try to run Outlook normally.